Pokemon Ruby's updated graphics with weather effects, amazing sound, more than 200 Pokémon with over 100 new species as well as its faithful adherence to the existing series of Pokémon games--makes for a welcome evolution in the series. 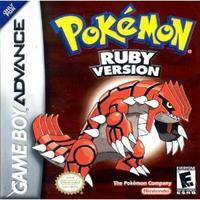 First, the game has a lot in common with Pokemon games Silver, Gold, and Crystal. For example, players can choose to be a boy or a girl trainer, an internal clock sets events at certain times, and you?re the game's handy-dandy Pokedex helps players keep track of the many stats. You're main goal is still to beat all the Gym Trainers and become the Pokémon Master. If you've played the old games, you will be right at home. But not all is the same. The most obvious change is in the battles themselves. Now that two Pokemon can fight on your side at the same time, you can tag-team them against an enemy by taking advantage of the strengths of your Pokemons while covering their weaknesses. For example, you can now have a water Pokemon watch your fire Pokemon's back. You can also Attack more than one Pokemon at a time. A whole new element to the game focuses on how berries are used in battle. And if you collect enough berries, you can take them to a Berry Blender and make a PokeBlock, which is a little super-charged candy that raises your Pokemon's "Condition" attributes. You can then groom your Pokemon for regional contests and compete for ribbons like "Best of Show," which will unlock additional contests. There's even strategy in how to best use your berries: pick too many and the berry tree will disappear; plant berries, though, and a tree will grow. You can also build a Secret Base in special areas of the game, which you can decorate just like you can your room. And let us not forget that Pokemon Ruby has a kickin multiplayer system, too. You can trade Pokemon, and link up to four players for incredible battles. The only downside is that you can't link up with the old Game Boy Color games.